Camping can be fun for some people, like me, but for others it’s a no-go for so many reasons, not least of which is the bathroom situation. While I would go camping surrounded by trees and the terrifying darkness of night, Amandoll prefers to stick around the good plumbing, so we compromise. So we hypothetically would camp out at our own house, for maximum comfort and minimum… camping. Here are our options. Are you paying attention, Amandoll? I’ve ordered them from most to least camping. The most obvious option for where to camp would be our yard, since we have one. The backyard is ideal but our front or side yard would do if we really wanted to be there for some reason. In the summer, the mosquitos stick around the back for the most part, so it’s likely we’d want to escape those. As long as theres enough room for a tent, or at least a sleeping bag. Let’s say the length of your human body is the amount of space we need. Whatever measurement we use, there are three sides of our house to choose from. We are lawn rich, is what I’m telling ya, as I remember all the weird nightmares I had about camping in the yardless area around my last apartment for ten years. This is not just normal camping with a bathroom attached. No, it’s so much more. It’s our own toiletries and hot water, our clean, spacious bathroom and shower. It’s our own full kitchen and snacks. If we need a blanket or a lighter, even a book to read, it’s right there for us to go get, and maybe take a quick break on the couch on the way back. Cooking inside is cheating, though, fyi. We will bring our food out to cook over a fire or atop a makeshift grill. To really rough it in our relative wilderness, but without being outdoors, our best bet is the attic. Our attic has an uneven floor, a temperature that swings wildly from day to day, no electricity or heating, drafty windows, and decades of peeling wallpaper, each with a sickly now-pale red color. We already stock it with flashlights and extra blankets. There is no bathroom or sink. 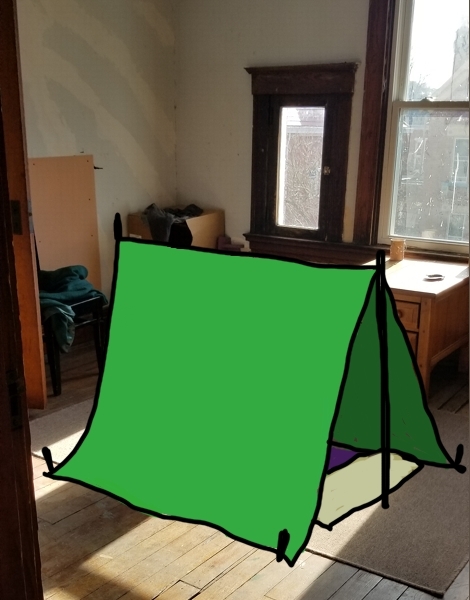 We can pitch our tent, wakka wakka, near the window that gets sun, on the rug the color of fake grass. We could probably even use the stakes in the gaps of the wooden floor, so that stampeding cats don’t knock our setup over. For the easiest version, with the least hardship or even moving around, we can make the living room our grounds. Since we’d be within the house and still have electricity and bathrooms, along with everything else we always have, we don’t even have to prepare. 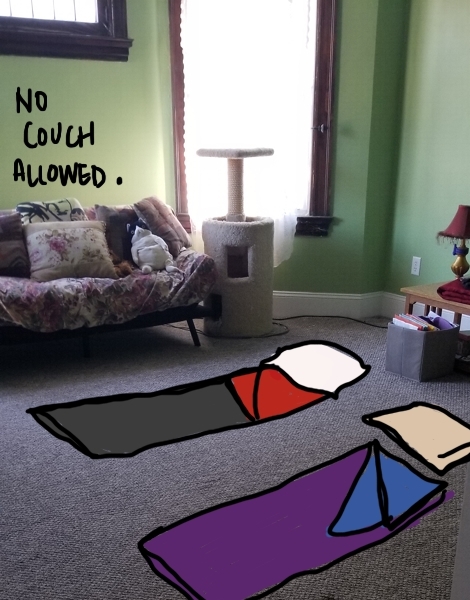 The tent would be a bit much for the living room even after we move the furniture out of the way, so we can just unroll our sleeping bags, hop in, and start the scary campfire stories.